Paul Verhaeghe’s paper implicitly raises this same issue of ethics in an elaboration of the difference between psychotherapy and psychoanalysis, once more approached via a question, – this time the hysteric’s – “How do I exist, what am I as a man, a woman, what is my place within the line of generation as a son, a father, as a daughter or a mother?” Again, in this paper, it is evident that the response to the question will determine, in the same way as the difference in responses to the Kantian question, the particularity of the different discourses. Verhaeghe sees psychotherapy as making use of the common-sense and universal responses which are precisely what the hysteric refuses. Psychoanalysis responds by leaving a way open for the hysteric to arrive at her/his own response which will ultimately have no guarantee outside the subject. This article is the text of a paper delivered to an audience of psychoanalysts, psychotherapists and students of psychoanalysis at LSB College earlier this year. Aisling Campbell’s paper on the Marquis de Sade’s writings illustrates the irony inherent in The One Hundred and Twenty Days of Sodom, showing up the fragility of the supposed masters of desire, in both their dependence on their objects and on the inescapable driving force of language. In a story which chronicles the debauchery at the Chateau of Silling and the pursuit of a pleasure unbridled by thoughts of what the consequences might be for the subject, the whole perverse scenario is shown to be driven by the Word, utterly reliant on the script of the storyteller, Duclos, and her colleagues. Those committed to the ‘act’ are shown to be as much prisoner of the words which drive them as the objects of their acts are by the high walls incarcerating them. 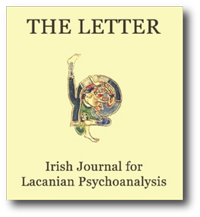 Cormac Gallagher and Mary Darby have co-authored a paper on Lacan’s optical schema, detailing the historical development of its use in Lacan’s work as his thought progressed, – a progress which is mirrored in the transformations of the optical metaphor itself. Reflecting the usefulness of the schemas as a theoretical device to illustrate the reality of a clinical practice, this paper includes a section on clinical observations made Possible by its usage. Following this is a Paper by C. Edward Robins originally presented during the first congress of the European Foundation for Psychoanalysis here in Dublin. Robins uses an old Chinese fable, The Man Who Sold Words, to illustrate the way in which the human subject is led along a path in life by signifiers whose meaning he is ignorant of, upon which he nevertheless acts and which somehow sustain him in his life. The story is also used to show how, in the course of a deconstruction of these signifiers by one who listens with an attentive ear, the truth can be heard to ‘drop out’. The final paper in this issue is a reconsideration of Freud’s case history of Little Hans in the light of Lacan’s work, and addresses itself to the question of what a Real father might be. The paper was originally presented at one of the Saturday seminars at St. Vincent’s Hospital. This is also to be the venue for the forth-coming first annual congress of the Association for Psychoanalysis in Ireland (APly! The congress, to be field over the weekend of the 26th of November, will take Hysteria as its starting point, as did Freud. Paul Verhaeghe will once more return to Ireland to deliver a paper at that event, and representatives of each of the working-groups here in Ireland will deliver research papers on behalf of their colleagues. The Letter will present the fruit of their endeavours to you in due course.